Info "Avoid the produce, but don't worry if the car gets hit! It'll be fine, trust me!" Produce Pandemonium is a microgame found in the Anything Goes folder in WarioWare, Inc.: Mega Microgame$!. 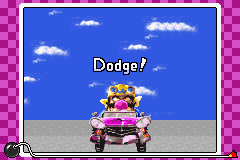 The objective of the game is to help Wario dodge the falling vegetables while he's driving. 1st level difficulty: The player must dodge one vegetable, then one more vegetable. 2nd level difficulty: The player must dodge one vegetable, then two more vegetables. 3rd level difficulty: The player must dodge one vegetable, then three more vegetables. This page was last edited on February 2, 2018, at 09:47.